Imagine filling Metricon Stadium with sand, to a depth of six metres.That’s roughly the volume of sand – some 113,000m3 - that will be used to top up Surfers Paradise beach this week, in a huge boost for the city’s coastal defences.That’s roughly the volume of sand – some 113,000m3 - that will be used to top up Surfers Paradise beach this week, in a huge boost for the city’s coastal defences.That’s roughly the volume of sand – some 113,000m3 - that will be used to top up Surfers Paradise beach this week, in a huge boost for the city’s coastal defences. That’s roughly the volume of sand – some 113,000m3 - that will be used to top up Surfers Paradise beach this week, in a huge boost for the city’s coastal defences. The massive mountain of sand has been excavated from the Jewel development site, where work is now underway on a $1 billion development featuring a five-star hotel and residential apartments. The sand is being donated by developer the Wanda Ridong Group under an agreement with City of Gold Coast. Mayor Tom Tate said the arrangement is a major win for Gold Coast residents and visitors. 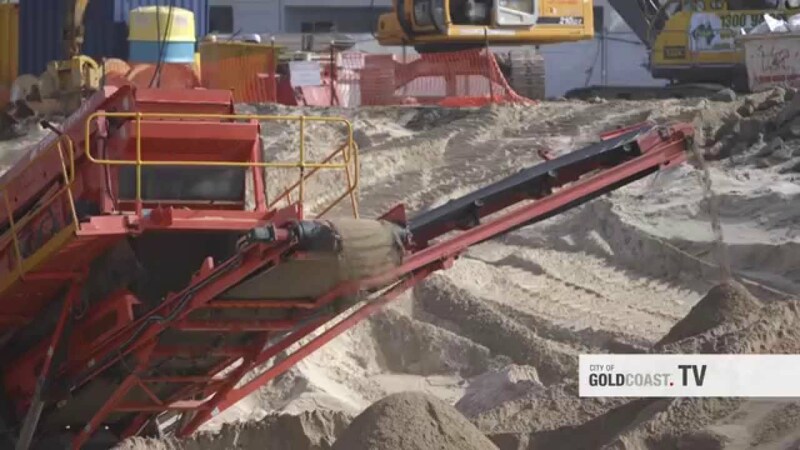 “This is the largest volume of sand ever received from a development site on the Gold Coast, and the biggest sand deposit placed on Surfers Paradise beach so far this century. As a result, it’s also a major cost saving for ratepayers in the fight against beach erosion,” he said. Wanda Ridong Group Gold Coast Development Director of Sales and Marketing, Andrew Bampton, said he was thrilled to get involved in helping to protect the city’s coastline. “The foundations for Jewel’s three towers will plunge tens of metres below the surface which has required significant excavation, so we wanted to be able to do something positive with this incredible resource. The intense cleansing process, and subsequent relocation, provides a major benefit for the coastline,” he said. The excavated sand will be sieved and deposited along the beach directly east of the development site, in an area which has experienced past erosion. Due to the natural northerly movement of sand along the coast, beaches and adjacent properties north of the site will also benefit from added protection. The Gold Coast is widely considered to be among the world’s best in coastal management, with the City investing almost $20 million in Beaches and Waterways works in 2014-15. Find out more about our Ocean Beaches Strategy in our Coastal Management pages.